These are pictures of my little one watering her own little strawberry patch. I would show you pictures of the ripe ones, but she wakes up early and picks them so the robins wont eat the ripe ones...so I have yet to get a picture. This has definitely been a strawberry year. Sometimes, they seem so flavorless and the flesh is white, but this year, probably due to all of the moisture, the strawberries are so big and flavorful. I am not fond of cooked strawberries but i love to add fresh ones to recipes. This is a fun take on a strawberry shortcake, just more portable. Hope you enjoy it. Preheat the oven to 350 degrees. With the paddle attachment, beat the butter and sugar together until light. Add the vanilla and eggs one at a time and mix well. Beat in the sour cream. Sift the dry ingredients directly into the bowl and mix well on a low-medium speed slowly adding the milk. Spoon the batter into muffin tins lined with paper. Bake for 18 minutes. Cool on a rack. When cupcakes are completely cooled, put the pudding into a pastry bag or zip lock bag with a round pastry tip and push gently into the center. Squeeze just enough pudding out to fill the cupcake until it plumps but not so much that it oozes out. Frost with Cream cheese Frosting and top off with a fresh strawberry. With a mixer, combine 1 cup of sugar with the butter and cream cheese and beat until very smooth. Next add the rest of the sugar and beat until smooth. Finally, add the vanilla and cream and beat on medium speed for two minutes or so. *If you need to add more cream feel free to do so. I am not sure where I heard it originally, that gnocchi meant "little pillows", but I can tell you it has stuck in my mind. As I was preparing to post this recipe, I thought it might be best to verify my definition. I'm kind of glad that I did, because I don't think it really means little pillows...maybe to someones cute little Italian grandmother, but not to the dictionary. My research reveals that gnocchi probably means knuckle, joint, knot, or lump. It is also referred to as a dumpling. If you are not familiar with gnocchi, it is a pasta made from potatoes. It is in fact, a cute little pillow of yumminess. If prepared correctly, they are light and fluffy and completely irresistible. Gnocchi is a fun kitchen project, that yields pretty awesome results....if you take your time and focus on the task at hand. If not, they can be heavy and chewy, and a big waste of time. If you like to play with play dough, this is the project for you. I have paired the gnocchi with a fresh and springy sauce that doesn't weight the dish down. And topped it off with oven crisped prosciutto and parmesan cheese. Peel the potatoes and wash them. In a heavy pan, boil the potatoes until tender. Drain and pass through a food mill or a potato ricer directly onto a cutting board or on the counter top. Sift the flour over the top of the potatoes. Make a hole in the center of the potatoes and add the egg, nutmeg, and the salt. Beat the egg with a fork in the center and then begin to mix it all together with your hands. Create a ball and then knead the ball for a few minutes or until the ball is dry to the touch. Take a fistful of dough and roll it in to a long rope. Cut the rope into inch long pieces. Run the pieces over the back of a fork. Bring a pot of salted water and drop the gnocchi in. When the gnocchi floats to the top, cook it for an additional minute. In all, it takes about three minutes. Drain, and toss in an ice bath to cool it down and toss with a bit of oil, if they are not used immediately. On a baking sheet, lined with parchment paper, bake the prosciutto at 350 degrees for 8-10 minutes. When cooked, set aside. In a heavy saucepan, melt the butter and olive oil together. Sauté the shallots until tender and translucent. Add the peas and the asparagus and toss with salt and pepper. Add the gnocchi to the pan as well as the parsley. Finally, toss with the ricotta and the lemon zest. Serve with a chip of prosciutto and parmesan. I have taught cooking classes for ten years. My specialty is cooking fresh, from scratch, easy meals...I try to make gourmet look cool and attainable. My classes are attended by busy men and women alike, just trying to put a good meal on the table. Many are just lacking in time and are looking for a more efficient way to get it done. With that said, Tyson has introduced a new product, that just might give those of you who are hoping for the same, a little break. 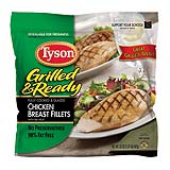 TYSON GRILLED AND READY, is a line of fully cooked chicken and beef products, that are ready to be inserted in just about any recipe. Ranging from a fully cooked chicken breast, to seasoned steak and chicken strips, to fajita style chicken and beef, each package found in the freezer, will serve six people. Last month, I was excited to receive a coupon in the mail courtesy of Tyson and FoodBuzz, to try this product out for free. Click on the FOODBUZZ window to the right--}} and join...if you do, you can hang out with me and tons of other talented foodies virtually! And when you join, be sure to go to the TYSON page and become a fan. I had my mind set on trying the Tyson Steak Strips, but alas, they must be so popular that both stores I checked were out of them. So I purchased the TYSON FULLY COOKED CHICKEN BREASTS. The instructions indicate that they can be brought to temperature in the microwave or convection oven. I chose to try the microwave, since I feel that is the least desirable way to prepare chicken, and I wanted to see if it stayed juicy. Prepared according to Tyson's Instructions, it in fact was still juicy and ready to slip into my recipe. In hindsight, I would have preferred to use the Oven Roasted Diced Chicken Breast for this recipe, but wasn't able to get it either. But by using the whole breast, was able to get nice shreds of chicken to add to my dish. So, what did I whip up? BUFFALO CHICKEN NACHOS, a totally fun and versatile mash up of a two classics....Nachos and Buffalo Wings. Give it a try for an interesting dinner or serve it as a fun summer appetizer...either way, you are sure to be the MVP of the night. Combine all ingredients in a saucepan and simmer on medium for five minutes. Combine all ingredients in a food processor and pulse until blended. Refrigerate and serve. Prepare the chicken, according to instruction indicated on package and let rest for 5 minutes before slicing or tearing into strips. Toss chicken strips in wing sauce. Spread mashed garbanzo beans on tortillas and top with the chicken. Sprinkle with celery , onion, and cilantro. Drizzle with blue cheese dressing and top with shredded jack cheese. Place in oven under the broiler for 8-10 minutes until bubbly.